Enough features for most people, but the interface needs some work. The world of computer security changes quickly, with new intriguing threats to consumers and unseen zero-day vulnerabilities. But like traditional email scams eScan Total Security Suite from MicroWorld Technologies remains the same. If you compare eScan TSS from four years ago and today, the Windows program is nearly identical. That may be by design as enterprises don’t like change, and MicroWorld’s focus appears to be on enterprise, not home users. The starting point for TSS is a dashboard with nine tiles. Each tile represents a different feature of the security suite, such as file scanning, web & parental control, firewall, and so on. 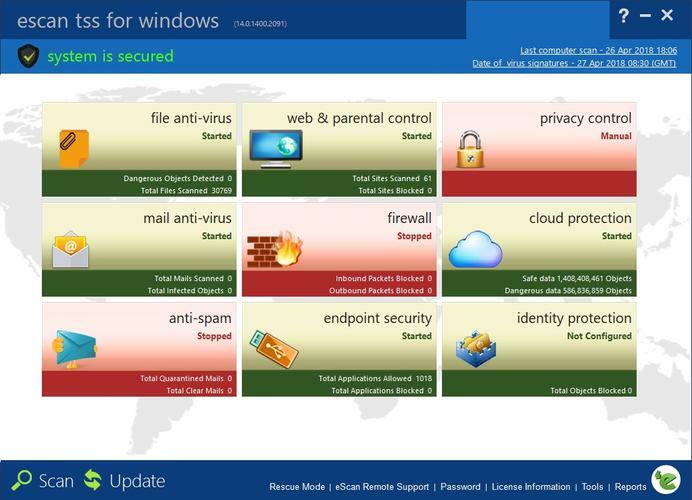 eScan Total Security Suite’s dashboard. Like many other security suites, it uses a color-coded system to help you view problems or potential problems at a glance. If something is red it needs your attention, if it’s green then all is well. It also displays some statistics relevant to each section, such as number of files scanned and so on. The first time you start up TSS you’ll probably see a lot of red as a number of features are not enabled by default. One of the oddest of these, at least on Windows 10, is the firewall. TSS does not enable it by default, but it also turns off Microsoft’s firewall upon installation. That’s not a great outcome. Personally, I just reactivated Microsoft’s firewall as the TSS firewall seemed like it was designed with IT departments in mind and not everyday users. eScan TSS’ file scan options. 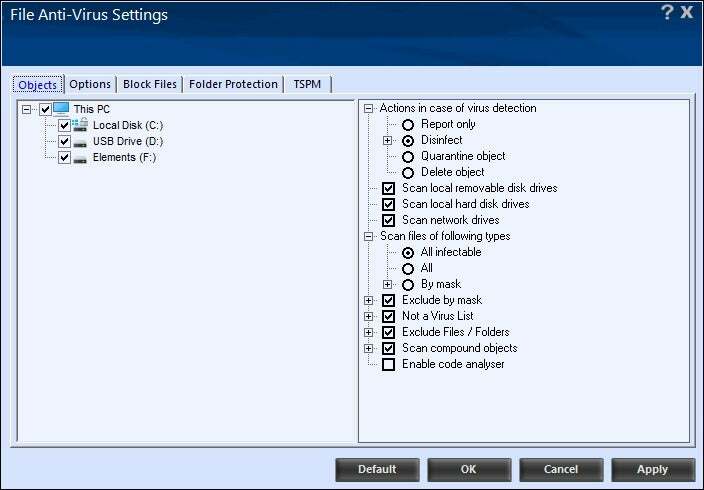 The TSS scanning feature is labeled File Anti-virus, which seems a little overly specific and confusing. 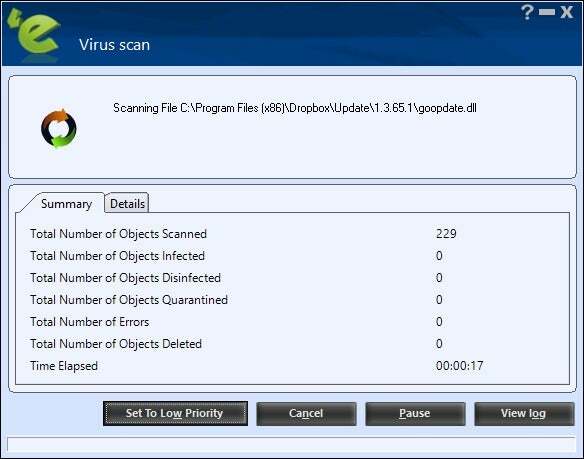 When you click on this tile it shows you a stats screen with the number of files scanned, whether the antivirus is enabled, and so on. Click on Configuration > Settings and you can customize what eScan does if it detects malware on a per-drive basis. This section also lets you deny access to certain files, and prevent executables on USB drives from running. The scan options in eScan TSS. If all you’re looking to do is run a scan, however, click Scan in the lower-left corner of the desktop app, which is accessible from any screen. 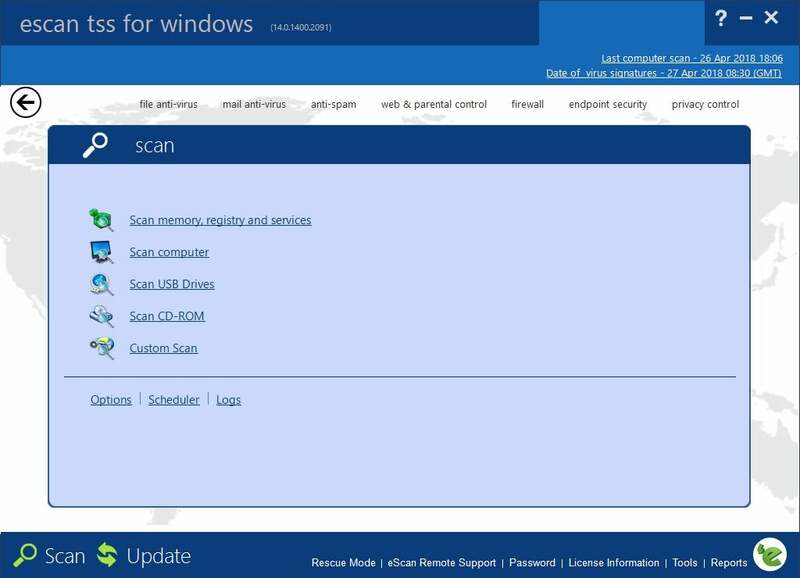 TSS lets you scan the entire computer, USB drives, or the CD-ROM drive; create a custom scan; or only scan your PC’s memory, the registry, and running services. MicroWorld also includes a tile for cloud protection, which is the company’s threat intelligence network. Nearly every AV suite has a similar protection feature. If any novel threats are detected, protection for them is distributed across all PCs on the network in real time. What’s unusual is to have this feature front-and-center. Usually AV suites like to tuck the on/off toggle for their cloud network deep in the settings so that no one turns it off. Kudos to MicroWorld for being more up front about this with their users. Endpoint Security allows users to block specific apps from running on your machine. It can also let you block USB ports so that no one can surreptitiously insert a malware-loaded thumb drive onto your PC. Oddly, the mail and anti-spam features are also turned off by default, which is not common. Again, however, this has the user in mind since it gives you a clear choice about whether you want TSS scanning Outlook or other mail programs like Thunderbird. Looking at all the various features of eScan TSS, the common theme is that none of these features are particularly easy to use for regular users once you dive into them. As I said earlier, a lot of them look like they were created with expert users in mind. The interface is also quite dated, which is no surprise since there hasn’t been a significant overhaul of the program in years. MicroWorld charges $56 for a single PC or $104 for five PCs. That’s quite restrictive considering that many of the major antivirus companies license 10 devices of any type for $100. eScan TSS with a scan in progress. Of the three testing houses that we consult for our reviews, AV-Test was the only one that had looked at eScan. The organization tested eScan Internet Security Suite, which is the lower-tier version of MicroWorld’s security suite. eScan scored a 100 percent for AV-Test’s “widespread and prevalent malware” test against over 5,000 samples. The suite’s real-time protection against zero-day and web and email threats was 98.3 percent, slightly below the industry average of 99.6 for this test (based on 225 samples). Overall, eScan scored a 5.5 out of 6 for protection. For our in-house performance tests, eScan performed quite well. In our PCMark 8 test, eScan TSS appeared to actually improve the performance of the PC. Prior to eScan’s installation, the PC scored an average of 2,482, but after eScan TSS was installed and performed a full disk scan, that number went up to 2,533. That’s a pretty significant jump, and something of a recurring theme with recent tests of anti-virus suites. If I had to guess, I’d blame it on the latest version of Windows 10 (spring update), as well as the Meltdown patches. The PC has not yet been patched for Spectre. In the Handbrake test, there was no change, with both pre- and post-tests scoring around one hour and 15 minutes to re-encode a 3.8GB MKV file to the Android tablet preset. MicroWorld’s eScan is a fair suite, but it’s not the greatest. In particular, the interface could be a lot friendlier to new users. If you’re already an eScan user and are happy with the suite then say stick with it. Some users might also enjoy fiddling with all the various settings within the suite. For the average user, however, you can find competing suites that offer less headaches with better value for your money.